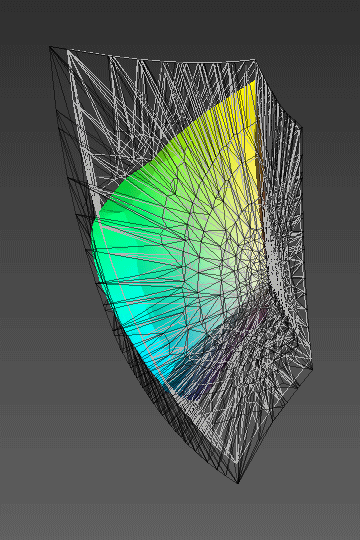 Plenty has already been written about the pros and cons of various working color spaces. ProPhoto RGB is very large, good for archiving raw captures, but inefficient for most actual output. Adobe RGB has been a practical standard for some time, but the gamuts of many modern printers now exceed it. Bruce Lindbloom has designed Beta RGB as a more efficient alternative, wider than Adobe RGB, but not as wide as ProPhoto RGB, and using D50 as a reference white besides. Unfortunately, the gamuts of my imagePROGRAF iPF6300 and PIXMA Pro9500 Mark II printers (12 and 10 pigment inks), and even that of my old HP DesignJet 130, slightly exceed even Beta RGB, mostly in the cyans and blues. At the risk of turning this into, “working spaces are like opinions, everyone has one,” I adjusted Beta RGB and came up with what I call, for lack of anything better, Russell RGB. It basically extends Beta RGB out a little into the cyans and blues. Also, I have personally settled on a reference white of 5500 K, and so chose this as the reference white for Russell RGB. The gamma is the same 2.2 as the rest. Below are plots created with iccgamut and viewgam, part of Argyll CMS, and viewed with Cortona3D Viewer. 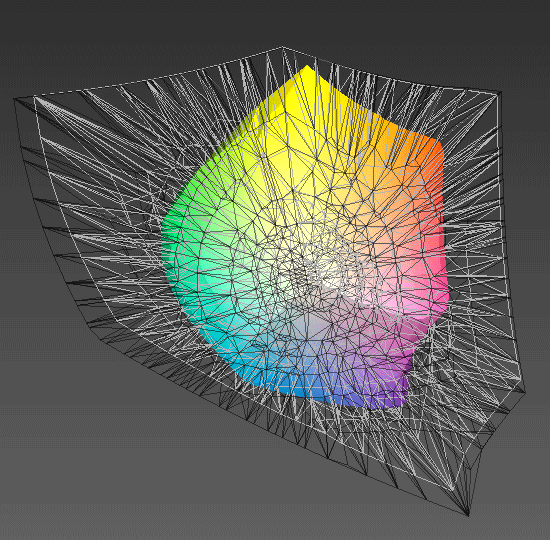 The solid figure is the gamut of Ilford Prestige Gold Fibre Silk on the Canon iPF6350 (GPGFS13_CANipf6350_PSGP280n.icc), the gray wire mesh is Beta RGB, and the black is Russell RGB. In the rotated figure, you can see how Beta RGB does not cover the entire printer gamut in the cyans and blues; Russell RGB almost gets it all. 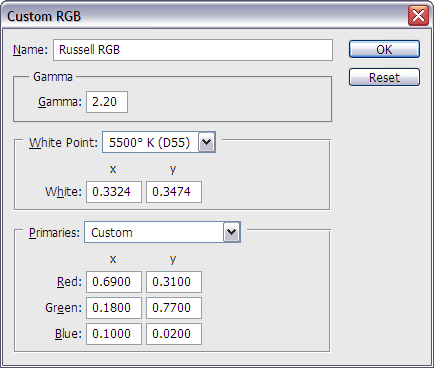 Here are the RGB-XYZ and XYZ-RGB matrices for Russell RGB, and ProPhoto RGB with a white point of 5500. For more information about the above, see The RGB-XYZ Matrix Calculator.